The main difference between enzyme and protein is that the enzyme is a biological catalyst whereas the protein can involve in the formation of structures, transportation, catalysis, and regulation of biological processes. Enzyme and protein are two types of biomolecules found in the body, performing important functions of the body. An enzyme is a type of protein while proteins are one of the four types of macromolecules found in the body. An enzyme is a globular protein that serves as a biological catalyst. It catalyzes various biological reactions by reducing the activation energy of the reaction by carrying out it through alternative pathways. This ultimately increases the rate of the reaction. Significantly, enzymes exhibit a high specificity to molecules which bind to it. The inactive form of an enzyme is called the apoenzyme and it is activated by the binding of a cofactor. The activated enzyme is called the holoenzyme. 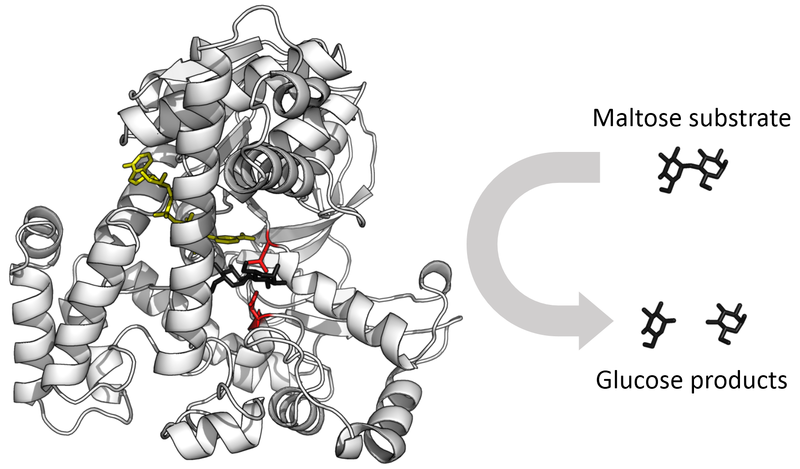 Substrates bind to the active site of the enzyme. By controlling the activity of the enzyme by the binding of inhibitors or covalent modification of the enzyme structure. The function of enzymes is vital in various biological processes of the body including metabolism and digestion. During digestion, enzymes secreted by the gut break down large molecules into small molecules, which are easily absorbable. During various biological processes, enzymes bring two molecules together to produce a new molecule. A protein is one of the four types of biological macromolecule found in the body. It is made up of a series of amino acids. The amino acid sequence of a particular protein is determined by the information encoded in the corresponding gene. The process of the production of protein is called protein synthesis, which occurs through two steps: transcription and translation. The bonds which link amino acids together are the peptide bonds. The synthesized polypeptide chain then forms either the secondary structures like alpha helices and beta sheets, tertiary structures like globular proteins and filamentous proteins or quaternary structure of proteins by coming together the protein subunits together. Proteins perform various functions in the body. They are involved in the formation of structures including muscle, cartilages, hair, nails, and cell membrane components. Most globular proteins serve as enzymes, hormones, and transport proteins in the blood. Other globular proteins called antibodies serve as key molecules in the immune system. Enzymes and proteins are two types of biomolecules found in the body. Both are made up of a series of amino acids. Also, they are expressed with the use of instructions on genes. 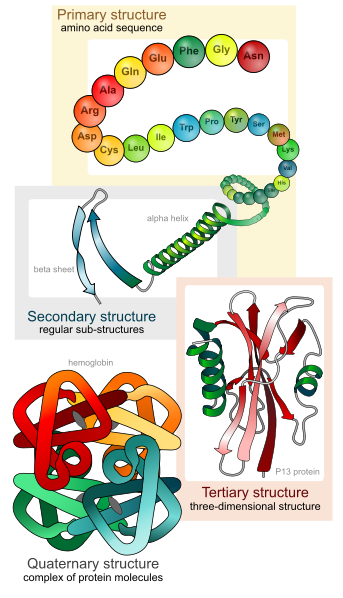 An enzyme refers to a substance produced by a living organism which acts as a catalyst to bring about a specific biochemical reaction while a protein refers to any of a class of nitrogenous organic compounds, which have large molecules composed of one or more long chains of amino acids and are an essential part of all living organisms, especially as structural components of body tissues such as muscle, hair, etc., and as enzymes and antibodies. Hene, this explains the basic difference between enzyme and protein. However, enzymes are a type of proteins while proteins are a type of macromolecules in the body. Another difference between enzyme and protein is that enzymes are globular proteins while proteins are either globular or fibrous proteins. Enzymes are classified based on their function while proteins are classified based on their chemical composition. The main function of enzymes is to catalyze biochemical reactions while proteins form structures, catalyze biochemical reactions, and regulate biological processes. This is another major difference between enzyme and protein. An enzyme is a type of globular proteins that serve as biological catalysts. They reduce the activation energy of a specific biological reaction to increase the rate of the reaction. On the other hand, proteins are one of the main four types of macromolecules in the body with both structural and functional roles. They act as enzymes, hormones or antibodies. 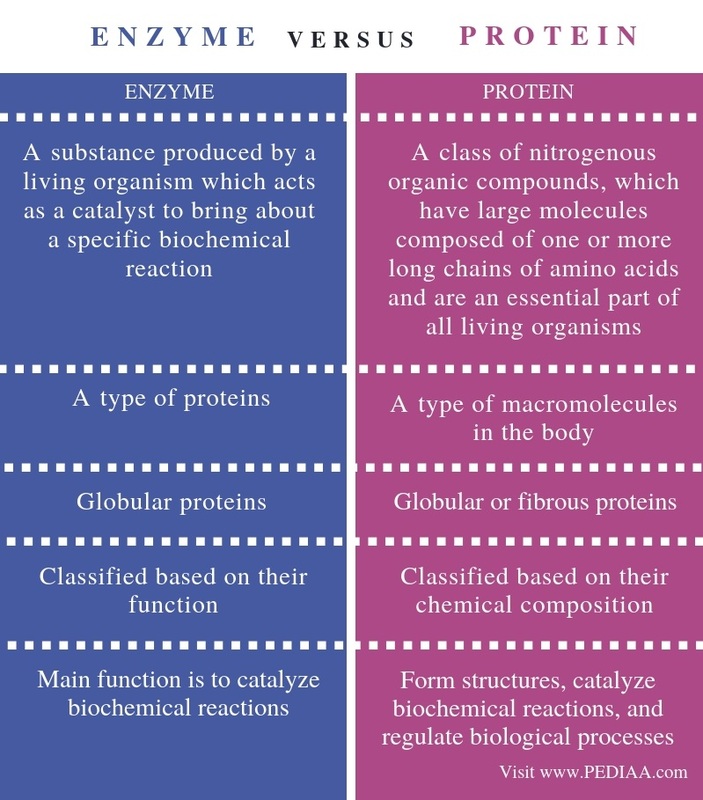 This is the basic difference between enzyme and protein.